After resting for a few days in Karen it was time to hit the road again. Staying at Jungle Junction an over lander site was great, I wasn’t feeling so good, the weather started to turn. It made sense to stay put for a while. 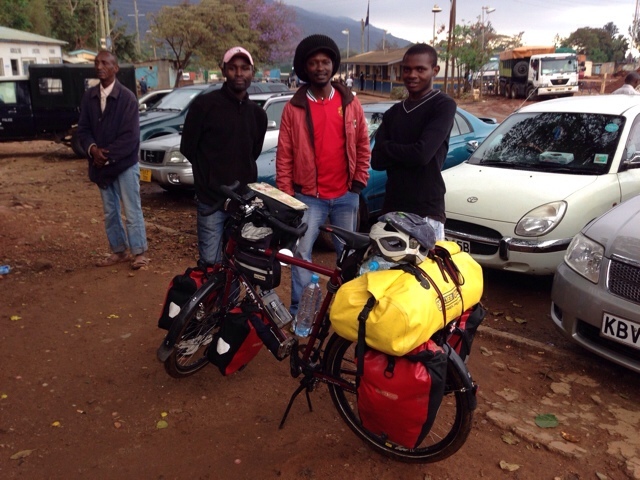 While at the camp I met several other travelers, all of them using motorised transport. 2 trucks and 7 bikers. 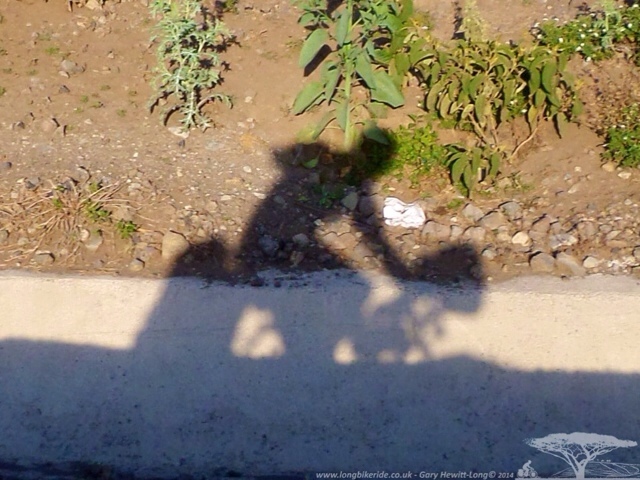 One couple on a bike from America, Gary having shipped his bike from the USA to the UK and ridden from the UK through West Africa before meeting up with his girlfriend Jamie in South Africa. After a few days rest and taking advantage of the fast internet at Jungle Junction to load the laptop up with some films, it was time to hit the road again, heading South toward Tanzania. 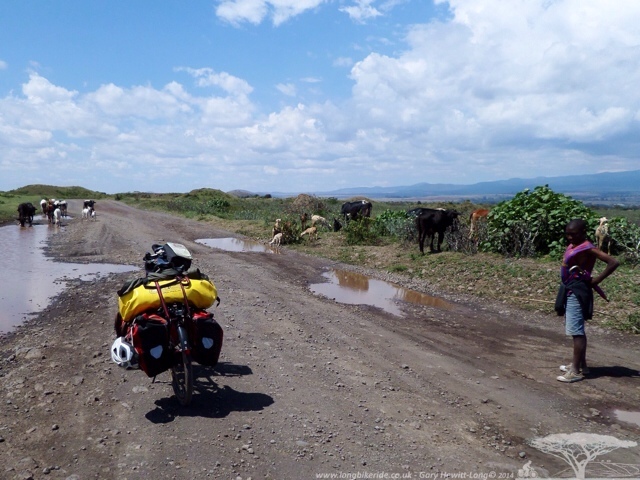 Following the road out of Karen, along the route described at the start of Chris Froome’s book “Climb”, through Ongata Rongai. The scenery slowly changed again. Despite Chris’ book describing descents from Karen, there were still some uphill bits on the way to the Ngong Hills. With a loaded bike you notice every incline along with those you’d not even recall if you are riding a lighter non loaded road bike. 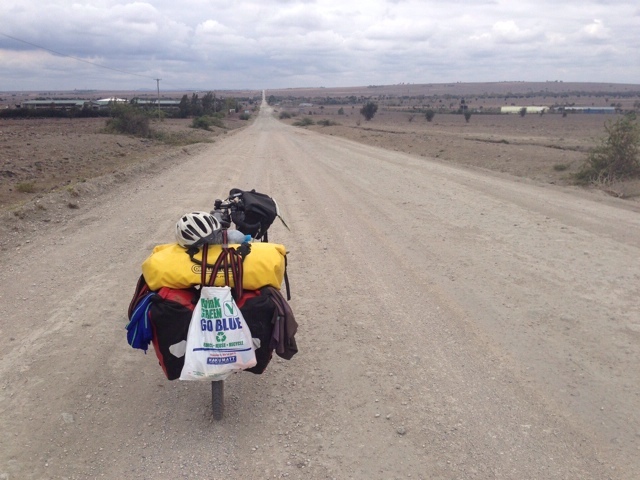 Turning left to head back to the A104 to a Tanzania, the Tarmac disappears to be replaced with Gravel track. Not the nice fast dirt roads of west Africa, but gravel with huge rocks sticking out ready to try and throw you off your bike if you dare to ride faster than 7 mph. The cars fare no better, weaving across the roads from side to side in a pointless attempt at trying to find a smoother route. Eventually the Tarmac returns and I rejoin the main road, along with its fast traffic. After riding through Bamako I thought I had seen bad drivers, Kenyans seem to be a league above in the bad driver stakes. Driving past with inches to spare. I despair as there is no oncoming traffic AND I’m cycling on the hard shoulder. Don't think you'll last long there mate! I see the remains of several casualties along the roads, a dog here, a snake there. And as I’m riding along I see a lump in the road. But it’s moving… Slowly, miraculously still alive. 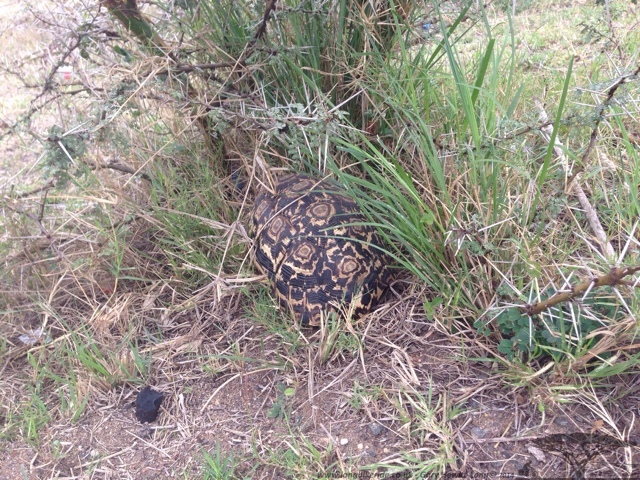 It turns out to be a big tortoise crossing the road (I’m reliably informed it’s a leap. At the speed he’s going he will never make it, a Kenyan Mututu (minibus) will soon crush him, shell and all. There’s only one course of action, stop and carry him over. He hisses at me, indignant at being lifted and retracts into his shell. He takes over ten minutes to come out again. 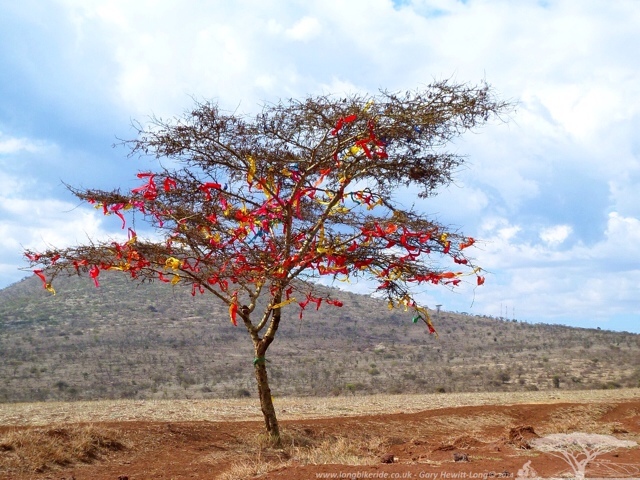 Heading further out of Nairobi towards open country, Maasai country and I start to see the recognisable red colours, men herding cattle are carrying spears and have lots of jewellery and their ears having been cut and elongated. It reminds me of my youngest son who’s put in one of those awful hole stretchers in his ear. At least the Maasai it iss traditional and they aren’t likely to be trying to impress people in the future at a job interview. Wild camping at night turns out to be difficult despite there being lots of ideal places earlier in the day. Eventually I find a gap where there are no fences or thorn bushes that have been cut and put together to make a fence by the Maasai. After waiting for dark I put the tent in a place I think there are no ants and termites, but after a night of rain I lift the groundsheet to find termites underneath. 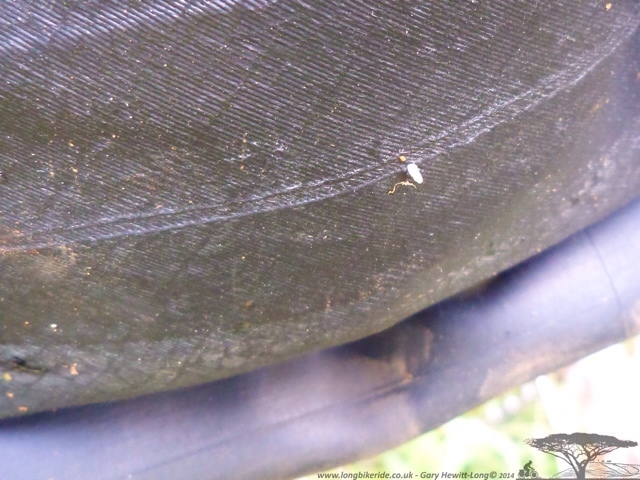 Luckily they decided not to munch on my new groundsheet. Creeping out of my camping spot at just gone 6 in the morning I get about 4 miles and it starts to rain again. Putting on my green high viz waterproof jacket for the first time in Africa I’m surprised it’s taken so long. In West Africa despite the rain, due to the heat everything dried really quickly after rain, but being much colder in the East, protection is needed. The rain stops after a short while and I’m able to take off the jacket and continue to the border. Just before the border the roads turn to dirt track and because of the rain it’s mud and deep puddles. The border is hilly and green trees return, but only for a short while. Arriving at the police dept a young lad tells me I need to check out of Kenya further on, I ask if I can change Kenyan Shillings to Tanzanian Shillings and he kindly shows me to a money changer. To my surprise the rate is good without having to haggle and I’m able to change all my Kenyan money to Tanzanian. 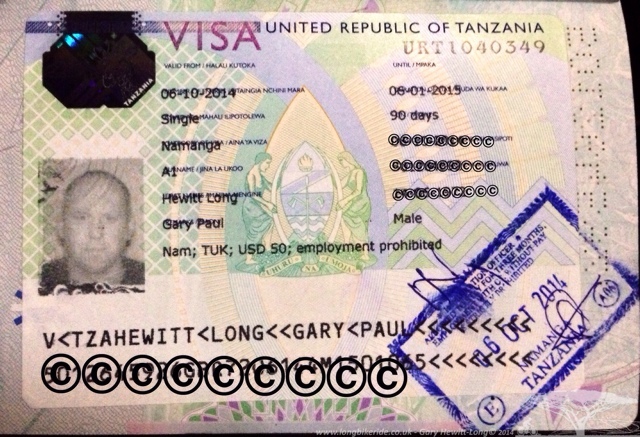 After being stamped out of Kenya I then proceed to get the visa on arrival for Tanzania, it’s very simple, fill in a few forms, hand over $50 and Bobs your uncle, there’s a 90 day tourist visa in my passport. Famished I dive into the nearest cafe and have a cup of tea and two doughnuts. The doughnuts here don’t have sugar on them. The man who owns the cafe comes over to talk to me and asks where I’m from, he’s Asian and when I say near Bristol in the UK, he smiles and tells me he lived there for a few years. Not long after the border the dry arid landscape returns, but the roads are good. 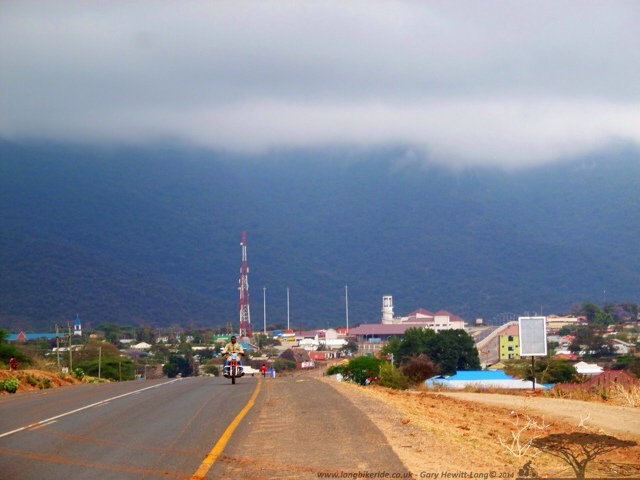 Then the hills start toward Arusha. First passing a big hill called Longido and then seeing Mt. Meru in the distance. After a long climb which takes all the afternoon in the heat I’m rewarded with the downhill in the evening light to Arusha. Just me and my... Shadow.. The football theme continues as with West Africa so far the premiership is the league that’s most followed. 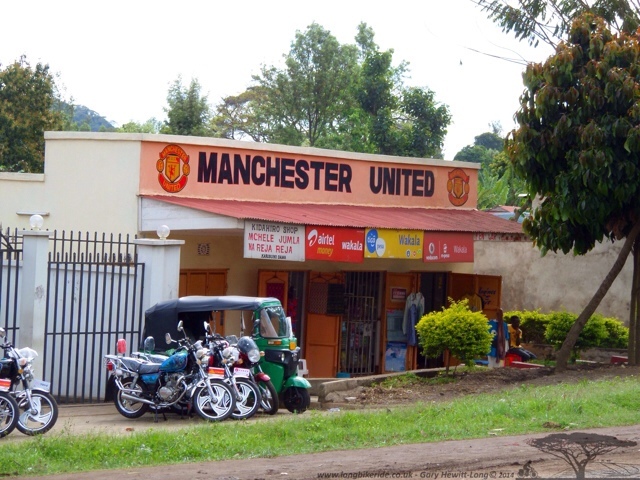 The buses have less football teams on them… In Tanzania they also paint the buildings! 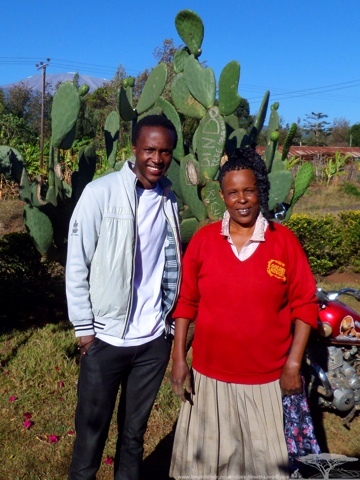 In Arusha I’d arranged to stay with Erik and his family who I’d made contact through the warmshowers website. Erik has a great workshop and he and his family are very welcoming. After a day of rest and some tinkering with the bike the road was calling. 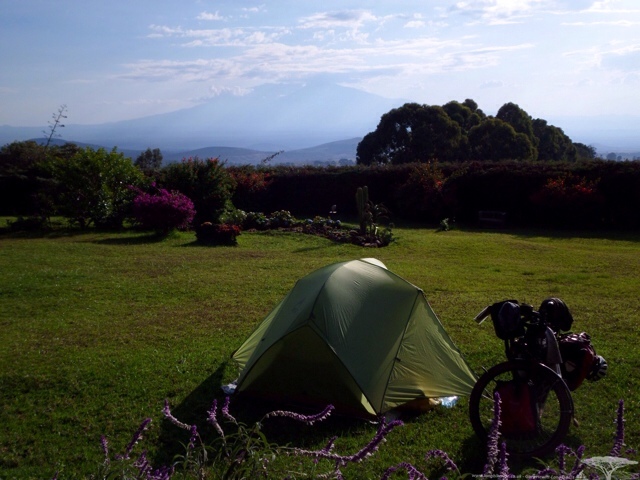 Leaving behind items I didn’t need for the next week I cycled towards Kilimanjaro, glad to leave behind some weight. But first I needed to stock up on food and get a Tanzanian SIM card. This all took more time than I would have liked. After first being told the SIM card would cost me 20,000 TSH and me explaining I hadn’t paid anymore than the equivalent of 2,000 TSH in the rest of Africa, the sim suddenly dropped in price and now including the sim, unlimited internet for a week and card cutting it was now 11,000 TSH, that’s more like it! 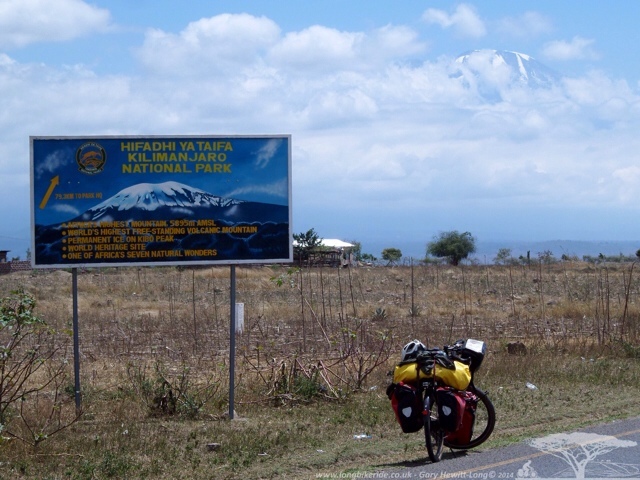 That done I pedaled East out of Arusha, at least for a while…Descending out of Arusha, the bike started to feel wobbly. I had a puncture after 18 miles (It’s a long descent). Pulling over I found a thorn in the tyre. While trying to fix it several children came by on bikes with very low or flat tyres, so I ended up pumping up more tyres than I expected! Thorns! Not your wimpy UK variety..
Getting moving again I needed to find water for the evening, saying “Jambo” to a man across the rode, he replied, “Hello, how are you?” in a very British accent. Sam, as it turns out had been to Sandhurst in the 70’s and had been a captain in the army. He replenished my water stocks then allowed me to stay at his place for the night with his family, feeding me and relaying stories of his time in England, meeting Montgomery a couple of times and after the army becoming a professional hunter, back when it was allowed to shoot big wild game. Sam would show wealthy tourists around Tanzania and help them to track, locate and shoot the Game they were after. And most importantly, make sure they remained in one piece. Apparently an Injured buffalo is extremely dangerous and an older ones on several occasions knows who to go for after it has run away, the blood has clotted and it turns back to get who injured it! Leaving Sam, Harriet and their son Michael in the morning I continued toward Kilimanjaro, determined to cover more ground than the previous day. Miles before I had to turn left toward the mountain I was thinking to myself “I wonder how spectacular it will really be, I’ve seen mountains before”. A minute or two later, I was about to see… I kept staring toward where the mountain should be, but there was cloud covering it. I looked again, but then looked higher than I had been looking, you know high that if you kept your neck at that angle for any length of time, you’d get a stiff neck… and there it was the summit sticking out of the clouds really high up! I mean REALLY HIGH up! I must admit, I was in awe at the sight. 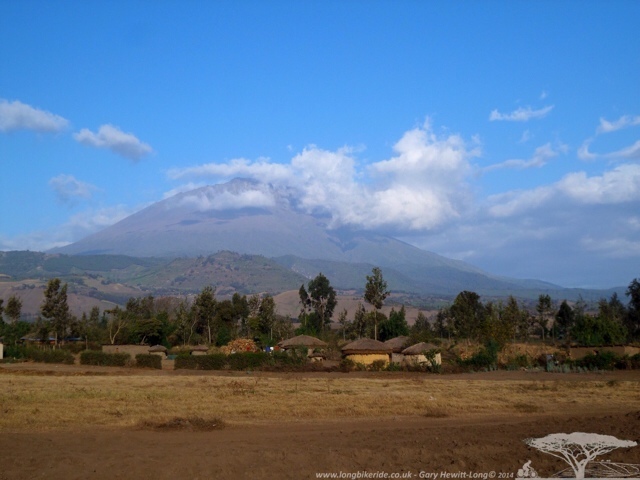 After another 20 miles I then turned left toward the mountain at Boma Ng’ombe. Ironically getting closer it becomes harder to see, the clouds being in the way again and nearby hills obstructing the view. Slowly following the road as the steady climbs turned into bigger climbs I soon passed through Sanja Juu where the tarmac ends and the track starts. Where's the Tarmac? Start of the Gravel/dirt. The track wasn’t the smooth Piste or Dirt roads I had experienced in West Africa. The West African dirt roads although full of holes were possible to ride at speeds of 12-13mph comfortably dodging around the big and picking good lines. 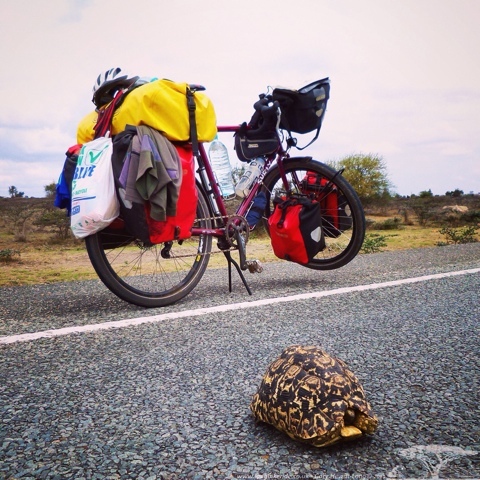 The track around Kilimanjaro is full of big rocks, 7mph is a good speed and any faster feels like the bike or luggage is about to break! Rock strewn gravel track turned into dirt tracks with rocks in it. 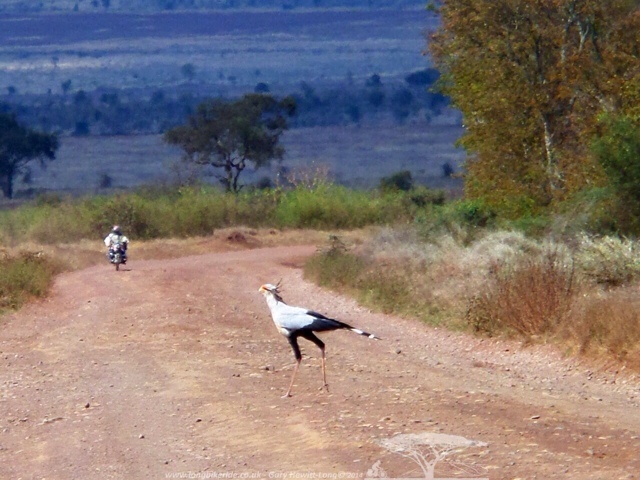 As I was thinking “I’m a roadie, I prefer Tarmac, but this Kilimanjaro!” a couple of huge birds lazily crossed the road, barely giving me a second glance. Secretary birds, the only two I saw around Kilimanjaro. Dirt track kept changing to gravel and back, the weather got hotter still instead of colder as I was hoping and the hills became steeper. Cresting one climb and looking over to my left was a tree with lots of cloth in it. None of the other trees had anything in them, just this one. No one I spoke to knew why this would have been decorated. 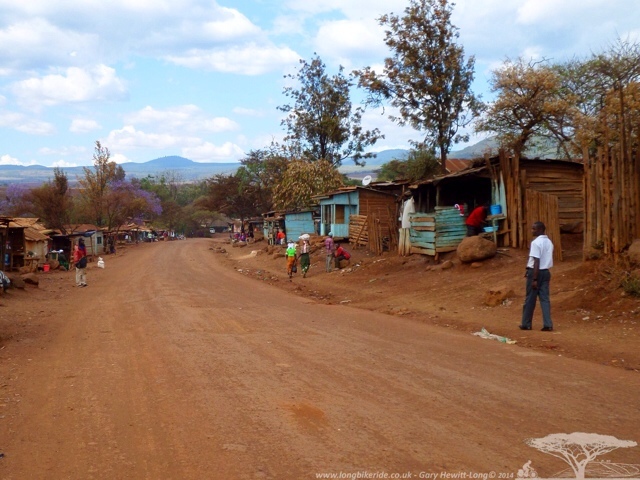 At Engare Nairobi the first real settlement along the dirt track, one would be forgiven for thinking you were in the Wild West, quaint buildings made of timber with a dirt road running through it. Making slow progress along the tracks a white pickup crests the next hill in front of me, it slowly comes to a stop near me and the occupants ask me “What are you doing? 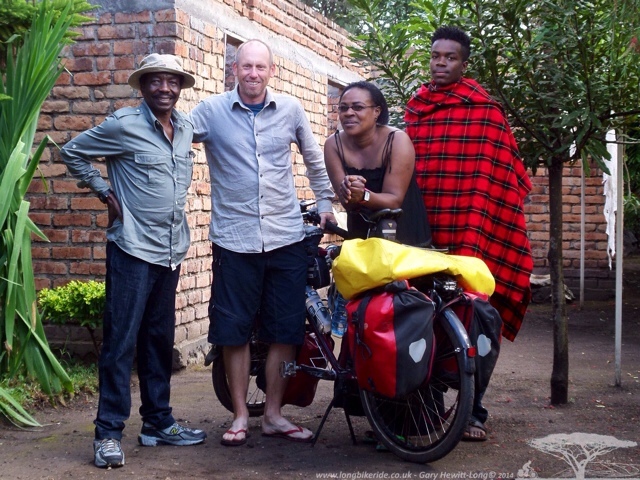 !”, explaining that I I have ridden from the UK and I am now riding around Kilimanjaro they seem astonished, but are very kind, their names David and Karina. David asks “Do you want somewhere to stay?”, of course I reply “that would be great!” and they give me directions to their farm, Simba Farm. Karina says “Put your tent on the lawn, I’ll phone the girls there and tell them you are coming.”, Dave adds, “and when your setup, get yourself a beer!”. It’s a couple of miles off my route and up a big climb but as I near it I am almost at 50 miles for the day, most of which is climbing hills, so I am ready to stop by the time I arrive there, tired. 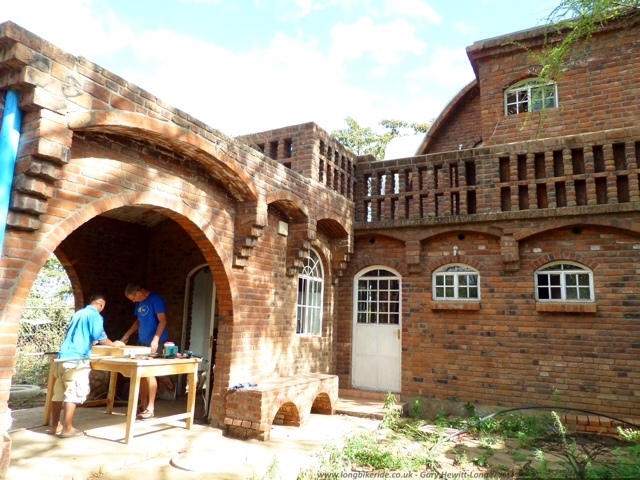 Simba Farm is both a working farm and a guest lodge, catering for wealthy tourists to see Safari and the mountains. I am very lucky to be allowed to stay at no cost other than paying for any food or beer I decide to have. One of the girls in the kitchen asks me if I want dinner and breakfast in the morning, looking at how nice the place is I reply “I am not sure, I am not sure I can afford it”. I decided after a while this was too nice a place not to have a meal, it’s an ideal place to come as a couple, but I am there on my own and with no other guests there, food and a beer while watching the sun go down would be rather nice. Relaxing with a beer while dinner was cooked and the sun started to go down, it was magical, to be quite high up and in such a fantastic place is hard to describe the feeling. Dinner came out, it was more food than I expected, a three course dinner, vegetable soup, fillet steak with salad and vegetables and homemade mango yoghurt for afters. All for 20,000 TSH ( £7.31). Breakfast was 15,000 TSH. The kitchen had to phone Karina to ask what to charge me. I don’t think these were the normal rates as a beer is normally $3, or 5,000TSH when the same beer in a local bar is 2,500 TSH. 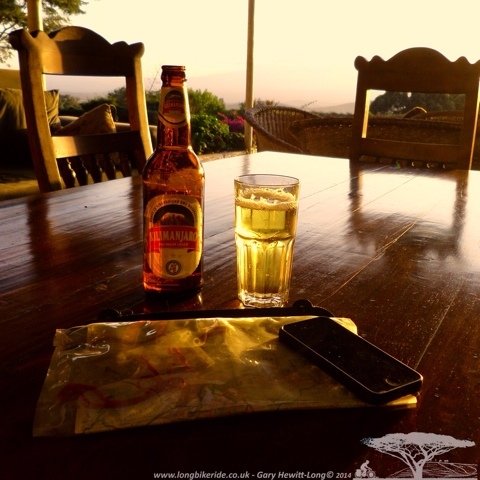 After a very nice dinner, I watched the sun go down by Mt Meru, slowly you could see the lights come on from the villages along the road from Arusha and later still lights flickering half way up the mountain, people climbing or camped on their way to the top. 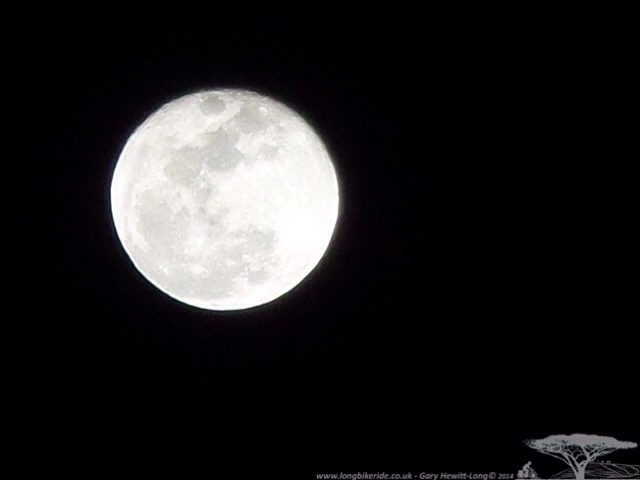 The sky cleared to show a moon brighter than I have ever seen before, it almost hurt to look at. Stars twinkling brightly above the mountain it was difficult to get up from the veranda to go to bed. I could have easily sat there all night in awe. 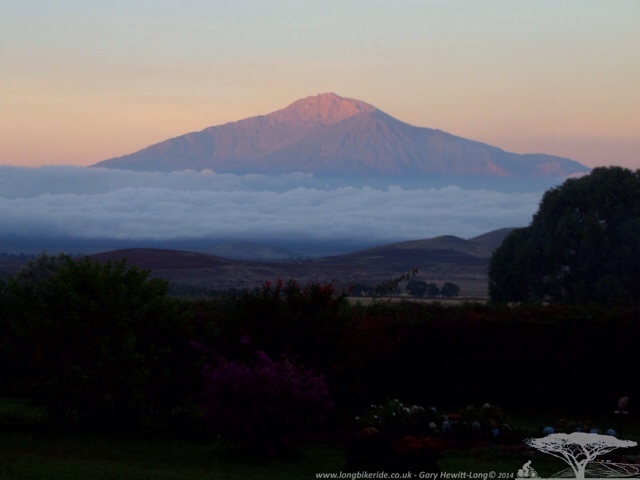 Waking in the morning I opened my eyes to a stunning view, Mt Meru with clouds below me. 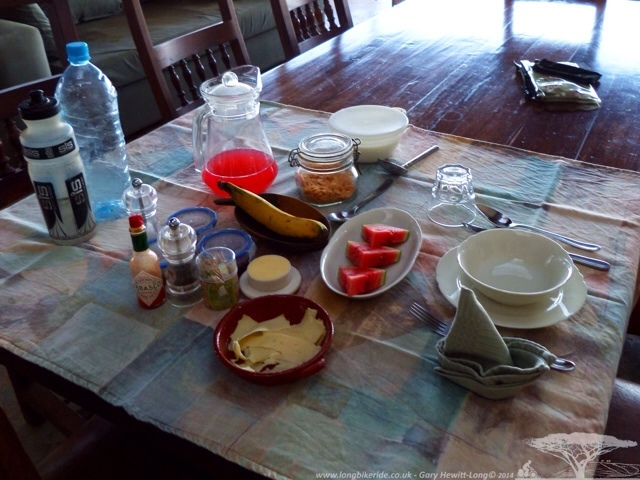 After a very hearty breakfast the temperature rose and it was time to set off before it got too hot. Again like dinner the night before, the breakfast was spectacular. Similar to Mt. Kenya, the East and North sides of the mountain are very dry places and tend to have less severe hills. Villages are all around the mountain but vary greatly in appearance because of the changing landscape. After what seemed like an age I finally reached Kamwanga where the tarmac started again. I’d travelled over two days on dirt/gravel tracks. 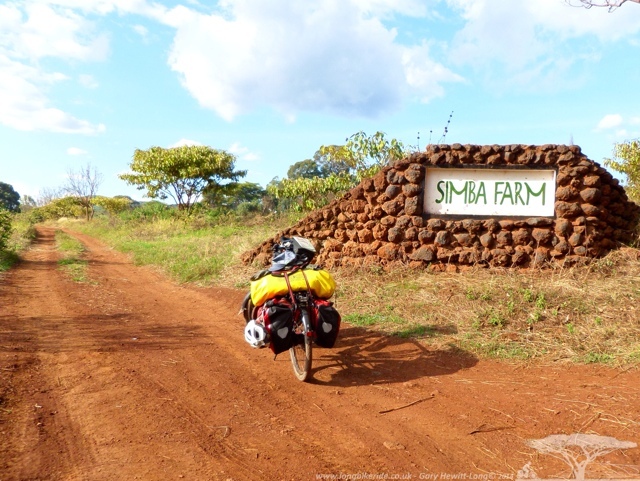 The dirt sections looked impassable in the wet and speaking to Willem at Simba Farm he confirmed that “you cant go anywhere when its wet, it’s too slippery”. I’d covered a total of 76km on very tough dirt track with lots of hills up to 22% gradient. I was quietly pleased I had made it back to tarmac and did think “Wouter would be proud I’d covered this track!”, as I only ever mentioned how much I dislike offroad whilst we were travelling together. 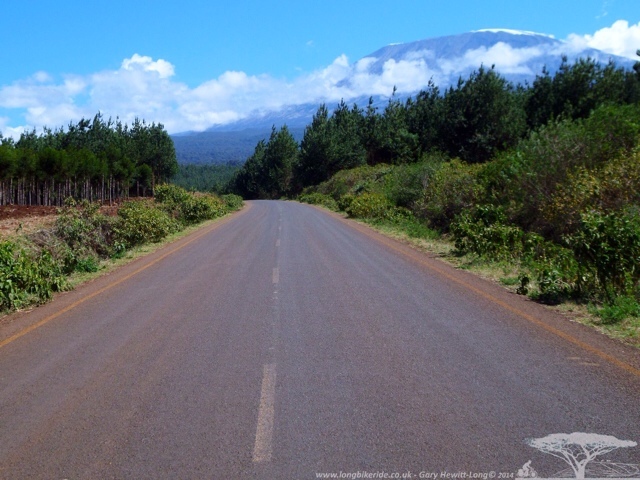 Coming out of Kamwanga I can smell pine, the scenery changes and the nice tarmac road is cast into shadow as I move in between the trees. My heart soars as I cool in the shade, smell the pine and cycling although still uphill in a lot of places, becomes easier. The Rongai Forest, several miles of pine being grown for timber, it almost feels like a Scandinavian country. To my left some baboons walk by, the big males looking at me menacingly. I daren’t slow too much to take my photo as they have young. Er.. That big fella looks scary.. 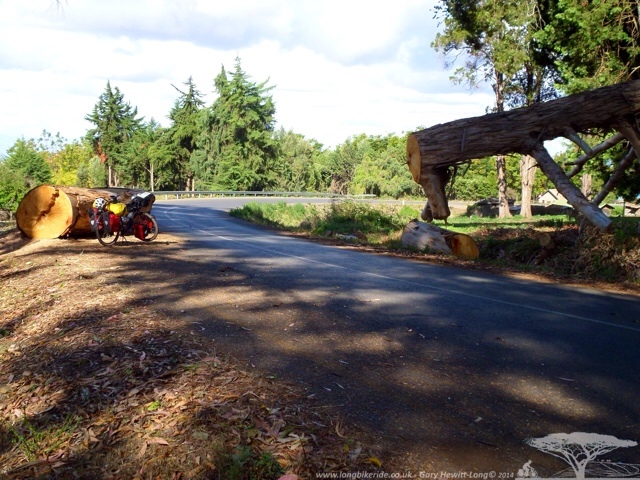 The next village looks to have been cut off not long ago, a huge tree had been across the road, re-opening the road by only cutting away the bit that covered the road. Too soon the forest ends, it was only 20 miles of pure cycling heaven, the smell of cut timber, pine and cooler air and the sight of the mountains is intoxicating. Dropping into Tarakea at the north east point of the mountain, I stop at a shop for a cool drink. Although I had passed many shops this one had a nice hedge around it and grass in front. 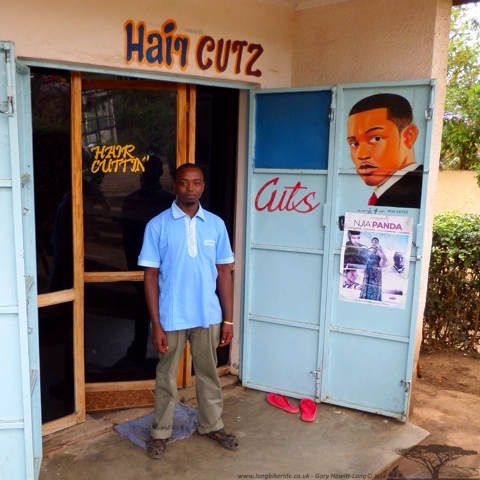 The owner doesn’t speak good English, but his son Ainhard does and he quickly fetches be a coke out of the fridge. Enquiring for somewhere to put a tent, the father explains it is dangerous; you must hire a security guard to watch over you. Explaining that I had cycled from England, over 6,500 miles and had never had a problem and assuring him that it is OK, he allows me to camp on the grass at the front of the shop. 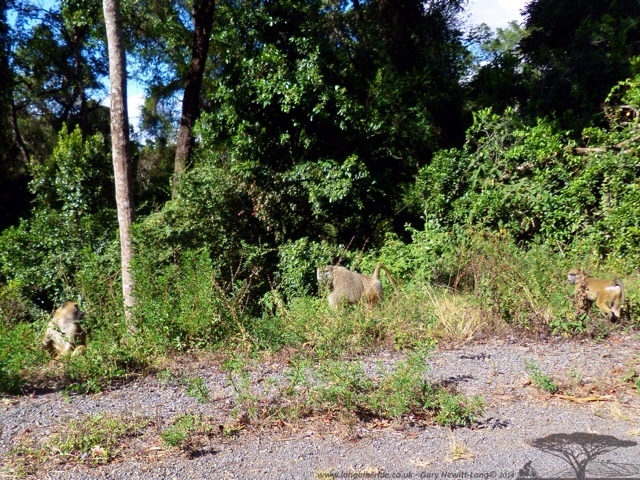 Ainhard was keen to show me their property, not only the shop but surrounding ground behind where there were crops growing, trees with Avocados and a plot to build a new house. Their current house in amongst their livestock, Cattle, Goats, Chickens and Rabbits. Ainhard explains he is studying to become a pharmacist and his English is excellent, he also explains “Kenya is just behind our house”. I knew we were close to the border but didn’t realise we were that close. 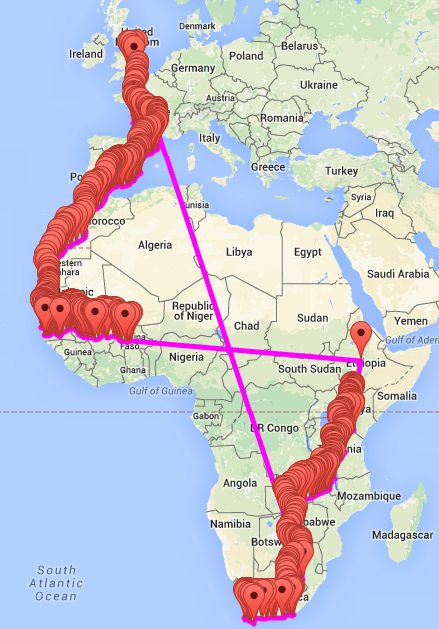 He shows me the boundary marker so I can stand one foot in Kenya and one in Tanzania. 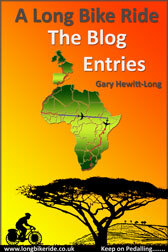 Unfortunately I had forgotten to bring my camera to record my illegal re-entry into Kenya, my visa only single entry! 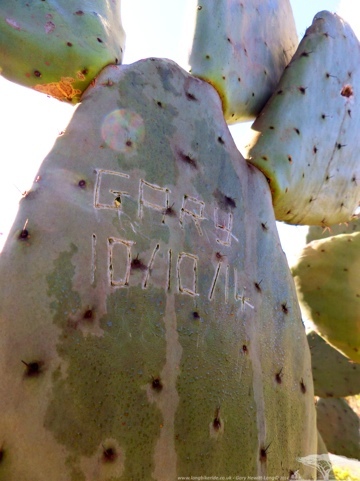 In the front lawn there is a big cactus with lots of names on it. Apparently if you write your name on it, it will be there for the life of the plant and Ainhard asks me to write mine. In the morning we see the mountains clearly and are rewarded with clear skies, it’s possible to see both Shira and Kimbo peaks, Kimbo being the highest at 5,892 Metres and with glaciers on the top. During previous research I had read that the glaciers are melting, melting fast. Ainhard tells me now he is 22, that when he was younger he remembers seeing the whole of the top of the mountain being covered. Now you can see only three parts from the north east side. 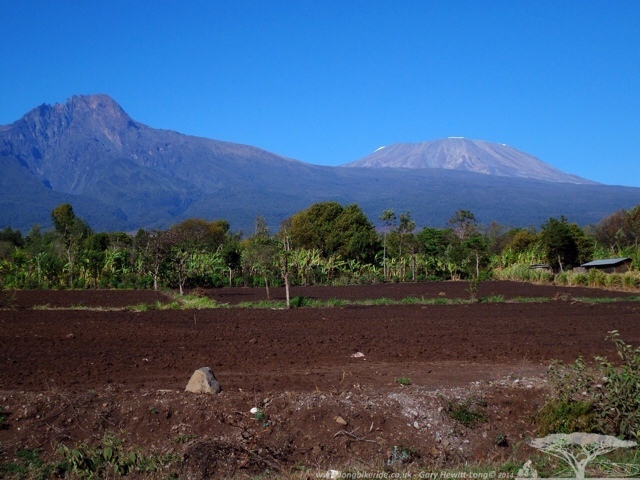 Kilimanjaro, Shira on the left, Kibo on the right. Leaving Ainhard and his family I continue toward Moshi, a town used as a base camp for many people who wish to climb the mountains. Coming out of the mountain the heat intensifies and although it had felt hot in the mountains, it was certainly a lot hotter off of it. 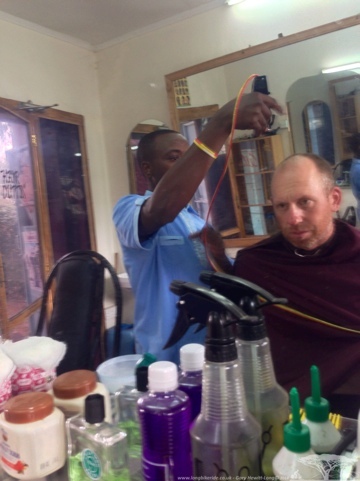 In Moshi there is a really good youth hostel that I heard of, Rafiki’s so I decide to rest there and wash my clothes. Hostels are good places along with campsites to meet other travelers and interesting people. 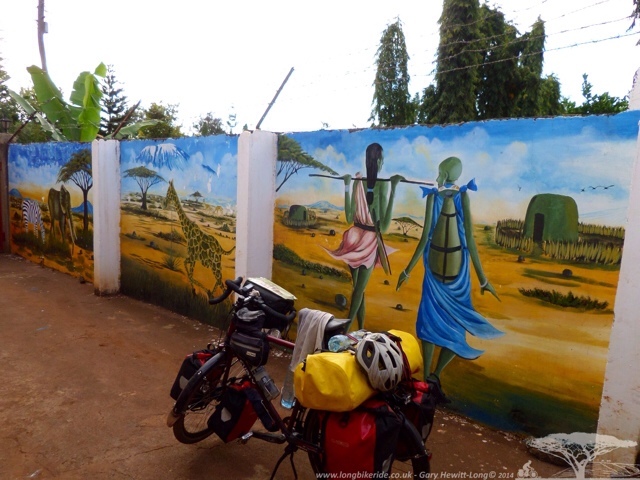 While there I bump into a Dutch couple I met in Nairobi at Jungle Junction, it’s amazing to meet again after I had cycled 300 miles since last seeing them. Cycling back to Erik’s in Arusha was pleasant, good roads and lots of places to stop for a drink or trees to sit under to rest under. The Maasai were busy herding their cattle, and with a sharp whistle the cattle know to cross the road. 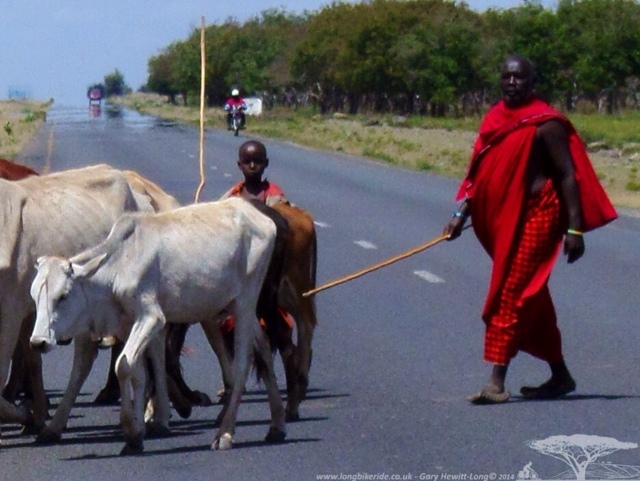 Maasai herding cattle over the road. Arriving back at Erik’s, he wasn’t home, I was told he’s at the other house. So I walk down to see him. Erik is building another house in his grounds and without the same constraints of building regulations in Europe and elsewhere he is free to build as he likes. Building a fantastic house with many unique features. 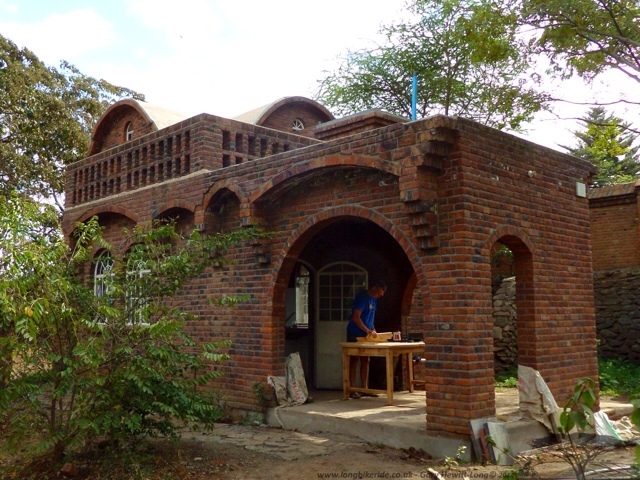 Erik is making his own bricks and taught himself brickwork and masonry and as he shows me through the house it gets more spectacular. 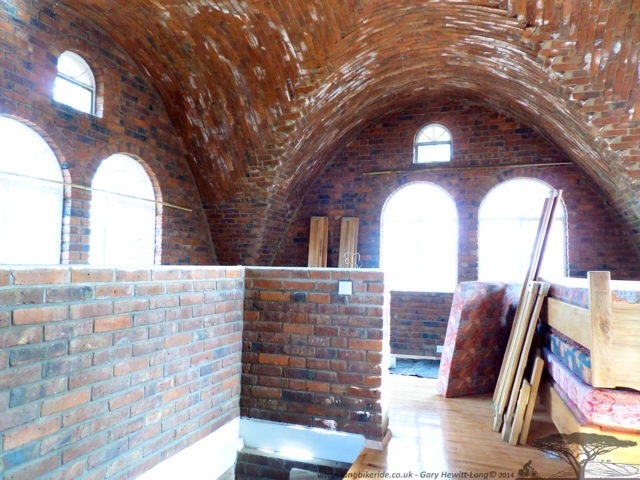 First he tried a small arch, then bigger arches, until he finishes at the top with some simply stunning brickwork vaulted ceilings. And who'd live in a house like this... Erik! My hair was getting long again, with the burnt nose/lips and the multi coloured beard.. oh and the shabby looking clothes, I suppose I looked a mess, maybe even a little tramp like. Time to have a hair cut and shave. 2,500 TSH later and I look a little more normal. Time for a trim, I'd gone bush.. Whereas I refuse to pay for a haircut or shave in the UK, for less than £1 it’s worth it and there are lots of these barber shops to choose from.